Is "Divorce Rock" a genre? I guess that's how one would describe that band Everclear, hmmm... Well, this is way better than Everclear. "Breakdown" is like dark, new wave Americana. Imagine if Prince and Ryan Adams went on a road trip and confessed all their wrongdoing. It'd be cathartic and grim, but it'd also be awesome and weird. Most people know Derek Grant as the ripping drummer in Alkaline Trio, but he's been making music for years and can sing and play any instrument like a virtuoso. It's actually really unfair and annoying how good he is at making music. 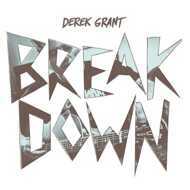 The release of this batch of songs is the final bit of closure on a rough, turbulent part of Derek's life, and thankfully for us, the final product is much more upbeat and likable than the trials that inspired "Breakdown".